Tiny Tot tumble and dance is recommended for students ages 2-3 years. This class provides parents the opportunity to spend quality time with their child as the student learns basic tumbling skills while also developing their motor skills and coordination. This format also introduces children to the instructor/ student relationship in a relaxed atmosphere. Students will receive instruction in stretching technique, beginning tumbling skills, and strengthening exercises. They will also work to improve and development their balance and coordination. 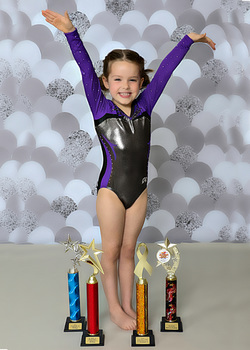 Instruction takes place in our fully carpeted tumbling gym which includes a rod floor, two tumble tracs, incline mats, balance beam, and various other pieces of equipment designed specifically for this age group. Our preschool class is designed to keep students moving and learning in a structured and caring environment. ​Children will learn basic stretches, beginning tumbling skills, balance and strengthening exercises, as well as dance and rhythm. This class is taught in our fully carpeted tumbling gym which includes a rod floor, two tumble tracs, incline mats, and various other pieces of equipment designed specifically for this age group. This class takes place in both our gym and dance rooms. Students will start in our fully carpeted tumbling gym which includes a rod floor, two tumble tracs, incline mats, balance beam, and various other pieces of equipment designed specifically for this age group. The students will then move to the dance room where they will learn basic ballet positions, steps, and center work through a fun-filled variety of exercises and games. Join us for an upbeat beginner dance class that lays a foundation for a lifetime of movement, coordination, and creativity! This class takes place in both our gym and dance rooms. Students will start in our fully carpeted tumbling gym which includes a rod floor, two tumble tracs, incline mats, and various other pieces of equipment designed specifically for this age group. Students will then transition to the dance room where they will learn beginning ballet and jazz technique along with choreographed dance routines. This class takes place in both our gym and dance rooms. Students will start in our fully carpeted tumbling gym which includes a rod floor, two tumble tracs, incline mats, and various other pieces of equipment designed specifically for this age group. Students will then transition to the dance room where they will learn beginning ballet, jazz technique, and tap. This class option is for students ages 5 and above who would like a recreational tumbling class that meets one to two times per week. ​This is a boys tumbling class for levels beginner to advanced beginner level. This class option is for students who are interested in participating in tumbling competitions. We have had many students attain a great deal of success at the national level. Students must attend a minimum of 2 classes per week.